When you aim to do the most comprehensive 10 day park shoot out ever, the last thing you want is feet of pow when you wake up. BUT as a true snowboarder, all you want is feet of powder when you wake up. The few extra feet of snow in our first week allowed us to extend our shred session for 4 weeks. Because of our park focus, this season we tested more flat snowboards than ever. The 2016 Endeavor Vice snowboard was like many of them–jib friendly–but also floated well in the pow. As you’ll see in the full review video, Greg, Ian, and Matt got a chance to rip through pow. If the 2016 Endeavor Vice snowboard was a car, it would be an American mid-century muscle car. 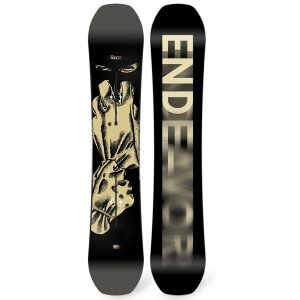 While other companies are trying to make an SUV or sports car, Endeavor snowboards has made the take-no-nonsense jib board. It acted like a 65 Mustang or 69 Camaro, in that it was ready for whatever you threw at it but the handling wasn’t always precise. Often with early rise rocker snowboards, you’ll find their handling to be a little looser. With the flat/early rise combo of the Endeavor Vice, we found that it wasn’t necessarily loose, but it wasn’t very responsive. On the plus side the early rise made spinning on boxes and rails catch free, and as we said before, it kept us afloat. We recommend the 2016 Endeavor Vice to any park snowboarder looking for a jib board, that can jump and handle the occasional pow. 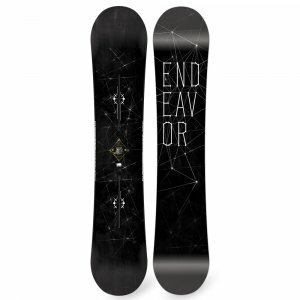 This Endeavor Vice’s softer flex is perfect for fun hit lines and park jumps and can handle any rail with ease. The E-Tech Construction keeps the cost affordable but still features our award winning Seamless Sidewall Technology and a full Poplar wood core. The Flat-Camber-to-Raised-Contacts gives the board an easy riding feel but engages when you need a quick turn.